I was first drawn to action sports when I was fairly young. I bought my first skateboard when I was about 9 years old and can still remember standing at the top of a half-pipe trying to muster up the courage to drop in. I quickly learned from that experience that no matter what you were trying to do or learn, it would take full commitment. If you didn’t put enough weight on your front foot, you’d fall straight on your backside leaving you pretty sore and beat up. I’ll never forget the feeling of my first successful drop-in. It seems pretty insignificant in the grand scheme of things, but that feeling of having a challenge that you’d never experienced before, and then conquering it, was like being on top of the world. This set my love for action sports in stone. It was all about how much you were willing to commit to something and how many tries you were willing to give it. No one is able to do it for you. You just have to keep trying until it finally clicks and then it becomes as easy as walking across the room. After trying skateboarding, I wanted to do it all. In the coming years, I learned how to do some tricks on a BMX bike, I raced motocross, I learned how to water ski, wakeboard, ride mountain bike trails, and finally snowboard. Growing up in Wisconsin, I learned that unless you found something to enjoy during the wintertime, you’d be miserable for five to six months every year; so when I was first invited to go snowboarding with some friends during my sophomore year of high school, I jumped at the opportunity. Being that I went with guys who already knew how to ride, I was given some quick tips and then I spent 90% of the rest of the day by myself on the bunny hill taking the rope-tow up and trying to teach myself to feel comfortable stopping on both edges before eventually being able to link some turns. After that day I was as sore as you can be at 14 years old, but I wanted nothing more than to get back out on the slopes, take new runs and start to get more confident at speed on a snowboard. Snowboarding was now my winter sport of choice and once I got my drivers license, I took every opportunity I could to go ride. I took my first trip out west with my family when I was 16. From my first sight of the Rocky Mountains, I knew that it was going to be snowboarding on a level that I had never experienced before. My first turn off the lift at Park City Resort in Utah had me addicted to everything about this new experience. From the length of the runs, to the stunning views and most importantly the epic snow conditions, I could not get enough of it. Fast-forward to now and I was given the opportunity to move to Colorado in June of 2017 with my wife to help open up (at the time) the newest SCHEELS store in Johnstown, CO. Having the Rocky Mountains so close is a dream come true for a guy who spends his winters on a snowboard and his summers on a mountain bike. Every time in the mountains is a new adventure and every time it snows the night before I plan to go ride I feel like a kid on Christmas Eve. I’m excited for yet another winter in the Rockies and the opportunity to help more people find the joy of carving your first turn in some fresh powder. 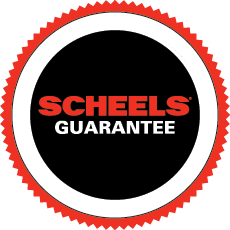 Scheels Guarantee Everything you buy at SCHEELS, on sale or otherwise, is guaranteed satisfactory or your money back. You don't take chances at SCHEELS ... ever. Receive special offers & promotions. Be the first to know about promotions, special offers and product releases.